I remember very clearly the first time I had Ro*Tel®. I was spending a summer working in Arkansas, and the family I stayed with made the now-(in)famous Velveeta and Ro*Tel dip. This was back in the 80s when thick and gooey cheese-coated nachos was all the rage at sporting events and sports bars, and I remember thinking how addictive that dip was. Even though I haven’t made the dip in years, I still always have cans of Ro*Tel® Diced Tomatoes & Green Chilies in our pantry because it’s such a great convenience item, especially when chili peppers are out of season. I throw it in soups and stews all the time, and it’s perfect for slow cooker recipes, or even spicing up a pot of plain rice. 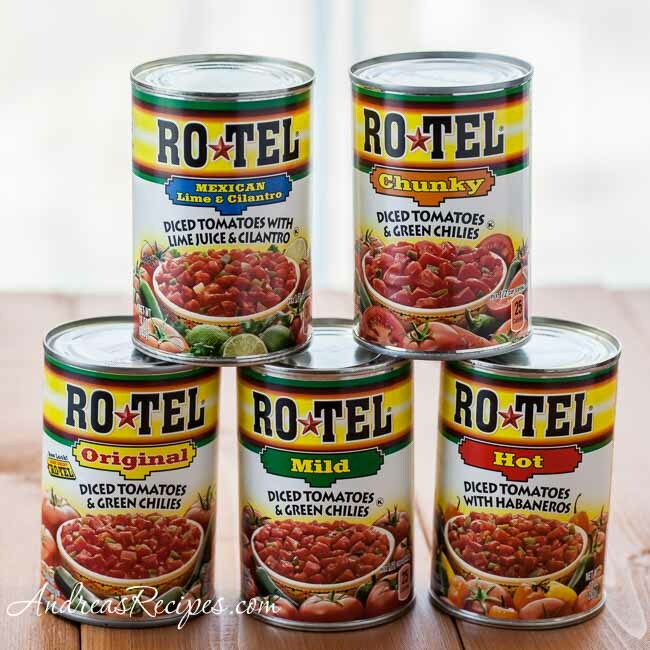 When you need tomatoes and chilies, a can of Ro*Tel® is perfect. Now there are six different kinds of Ro*Tel® to choose from—Original, Mild, Hot, Chunky, Mexican with Lime and Cilantro, and Chili Fixin’s (missing from the photo below)—so you can pick one to match your dish and heat preference. 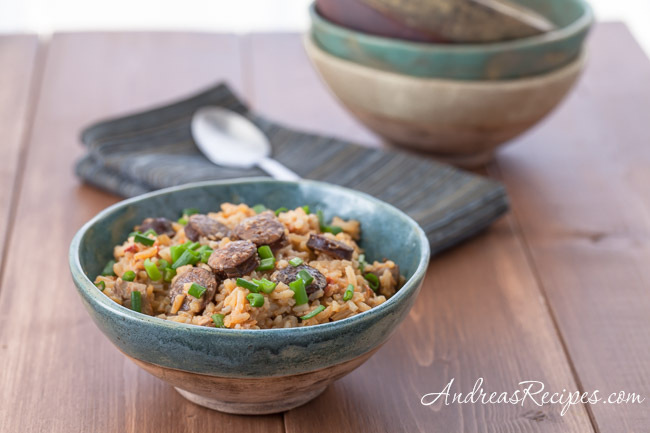 For this jambalaya, I use one can of Original and one can of Mild, but you can mix it up however you like. P.S. Aren’t those rustic bowls beautiful? I must give a shout out today to my fabulously talented Aunt Doris, who made those for me. I think I’ll have to get some plates to match, too! Melt the butter in the large cast-iron skillet. Sauté the onions, carrots, and celery until soft, about 5 minutes, then transfer to the slow cooker. Sautéed the sliced sausage until browned, about 8 minutes. Drain the sausage and transfer to the slow cooker, reserving 2 tablespoons of the rendered fat. Sauté the cut chicken pieces until lightly browned, then drain and transfer to the slow cooker. Add the tomato sauce, Ro*Tel®, chicken stock, Creole seasoning, oregano, cayenne pepper, garlic, and bay leaves. Stir and cover. Cook on low about 5 hours. Stir in the rice and continue cooking on low for about 10 minutes, then turn heat down to warm for about 20 more minutes. Stir and serve in bowls with chopped green onions for garnish. Great recipe; just bookmarked it! Thanks Kalyn, my guys loved it! Are you using uncooked or cooked rice? Hi Lydia. It’s uncooked rice. Thanks for catching that, I updated the ingredients list.